Tasting Note: Pale straw; grassy, apple, pear aromas; off-dry, citrus flavours. From the Navip website "We do not produce wine, we squeeze grapes...for everything else we have to be thankful to God, Nature and our 150 years of expertise." Serbia has a wine industry! From Wine-Seacher.com: Serbia is a large producer of both red and white wines and is at its best when producing red wines. Until Teena came home from the LCBO yesterday with a bottle of Navid Fruska Gora Riesling, we sure didn't. Apparently Navip was founded in 1848 for the production and sale of wine, brandy and other alcoholic drinks. Who knew? From their website ... "Navip is the biggest exporter of wine in the former Yugoslavia, with operations throughout the country. Today it continues to harvest some 2,000 hectares of vineyards, producing over two million tons of wine yearly." Of Fruska Gora Riesling ... "Grown in the infamous wine region of Fruska Gora along the Danube River, this refreshing wine has a pale gold colour and a creamy, rich texture. Stands well alone or paired with a variety of dishes, relaxing you after long working hours, perfectly." I needed relaxing after my long working hours, so it was with a sense of adventure that we opened up the bottle and had a taste. 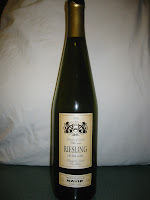 It is not fruity like Rieslings we have had and we found it rather tart. Personally I would give it only a 5/10. It was worth a try, though. what if you did not know where the wine is coming from? I just picked this up at the LCBO this afternoon. I found it randomly and was intrigued. I actually like it very much! At $8.50 it's much cheaper than most wines I purchase, and often a price tag so low can indicate a poor quality wine....definitely not the case with this one.